George Ella Lyon was approaching 50 when she set down her childhood memories of a cat she’d found in a small mining town in Kentucky. The cat’s name is Boulevard. You see her silhouette on a trestle bridge over a grassy, tree-lined river – with blue mountains in the background. “I found her at the drive-in movie,” writes George Ella Lyon, “on the playground in front of the screen.” The cat on the playground sits attentively, bravely studying a little girl with its ears perked up – but in the background are classic cars from the 1950s. It’s not only a cat’s perspective – it’s a cat’s perspective from the distant past. Each page in A Traveling Cat shows beautiful, moody illustrations that show the world in colored chalk – the shades of color in the sky, the bright green of a field – and they make the familiar seem special and magic. When autumn comes, the trees turn orange and yellow. And ironically, one of the most beautiful drawings is on the page with the copyright notice. It’s a two-page spread showing dawn’s light over dark and purple hills. The traveling cat’s road is streaks of yellow, orange, purple, and blue. It’s as though the whole world was being seen through the eyes of a cat. But the text reads like poetry. 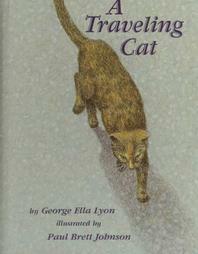 (“Bouvie had a night-colored coat splattered with gold, like stars.”) And it captures the mystery of life with a cat. The cat disappears for a week, then surprises the family with kittens. On a stormy night she walks through the door, and drops the tiny kitten at their feet. Then does it four my times, depositing five kittens. The cat’s gone for good. The book imagines her wandering up a shadowy road with the sunlight through the leaves. But the book finds a positive philosophical note to end on. “Dad says Boulevard stayed a long time for such a traveling cat.